A while back, we took our first family vacation to Disney world and Universal Studios in Florida. The kids were over the top excited. They could hardly wait. They knew they each had an allotment of spending money, and when it was gone, it was gone. They were very much into Harry Potter, and for months, all they could talk about was getting a wand at Harry Potter world. That was the only thing they wanted from the whole trip – that beautiful, magical wand. They imagined, planned, talked, and dreamed about holding that amazing wand in their hands. The time finally came for the trip. The schedule was this: three days in Disney world, then the last day at Harry Potter world (aka, wand nirvana!). If you’ve ever been to any Disney park, you well know how each ride ‘conveniently’ exits right into the gift shop, where you are suddenly inundated with every souvenir you could possibly imagine that matched exactly the great ride you had just experienced. Our children’s amazement was no match for the bright lights and flashy toys. Instantly upon exiting each ride, the pleas started. … and so went the cries. After every single ride. Convinced that what lay before him at the present time was going to bring him so much more joy than what was waiting in the future, he reasoned why this toy he had in his hands now would be so much more fun than the wand that lay in the distant future. He took out his money and bought it. The days passed, the new toys quickly got old and lost their luster. We started our final day – the grand finale… in Harry Potter world. The kids eagerly sought out the wand stop. Much to their disappointment, they did not have enough money to buy the wand. They had all squandered their money on other toys that seemed fun at the time. When they laid eyes on the wand, however, they realized that this, indeed, was what their hearts truly had wanted all along. But their choices had led them down a path where they could no longer afford it. They begged. They pleaded. They bargained. My mother heart broke. I so wanted to go back on our agreement and get them the wand anyway. But what lesson would I be teaching them? We had made a deal together, and set up rules and guidelines, to which they had eagerly agreed. I had to stay consistent to the lesson and plan. I knew they had made choices that were not in harmony with their true desires, and now they had to be held accountable to those choices. What had promised to be a fantastic ending to a dream vacation, instead turned into a day of regret and remorse as they realized all too late that they had squandered their valuable dollars on the flashy here and now and let go of their longer vision. I have thought back on this experience many times. Are there things in my life that I plan for, ache for, and dream for? Are the actions I am taking today consistent with helping me achieve those goals, or am I squandering my most valuable asset–my time– on things that I know will not bring me my true hearts desire? It’s easy to get lost in the day to day muck. 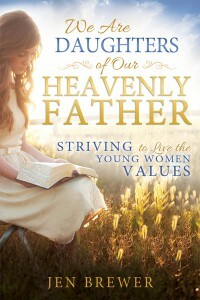 I need to constantly remind myself that there is such a greater goal out there – that of eternal life, and being together with my husband and children forever. Every now and then I need to stop, step back, and really listen to see if God is kneeling in front of me, gently reminding me that I am looking at something in the here and now that will not get me to the true-long-term happiness that I so desire with my family. Course corrections are never easy, but they are oh so vital to help us reach our ultimate destinations. The more I navigate the mountains of motherhood, the more I realize there was a LOT left out of the ‘perfect parenting’ manual. Or maybe it was just in the fine print that I always skip. and then later regret having skipped. And I’m not even to the teenage years yet… oye ve! For the past year we have been on the baby bandwagon. Since we have fertility issues (yes, I know, cry me a river right?? It sounds so strange to claim ‘fertility issues’ when we have 5 little ones running around!). Each one has come with the help of clomid, and some well-timed, ahh, ‘together time’ (gotta keep it pg!). In the world of infertility, I am well aware of the fact that I am incredibly lucky and blessed to be able to jump start the process with a simple pill, and that’s how simple it has been with all of our pregnancies – the first 2-3 months, and bam… baby in the oven. This last one was a little different, however, month, after month after month of up and down and every which way. After a year of this, We finally saw the ever-covetad ‘extra line’ on the stick and the crazy cravings and nausea entered in full force. At the first Dr. Appointment, imagine my surprise to find not one, but TWO little babes in the making. After the initial shock of “how in the world are we going to do this? !” we started to get pretty excited. The twins we had (our first born) were ecstatic to welcome another double bundle to the family. We went in for a routine ultra sound, and were completely blind sided to find that there was no heartbeat in one of the babies. I felt like I had just been punched in the stomach. We spent the next week going through every emotion under the sun… so sad, then so happy to still have one, then super guilty for being happy to have one, then sad again… crazy times! Fast forward another month, and I start to have some signs that send us into the ob-instacare wing, with fear and stress of what is going on with this little one. Never before has a tiny heartbeat meant so much. I didn’t realize how wound up I was until we saw that heartbeat and I let out a little screech. My husband grabbed my hand and gave a big squeeze, showing his relief as well. So as of now, still pregnant. And praying like crazy that we can go through the next 6 months with much less drama then we have had for the past 3. 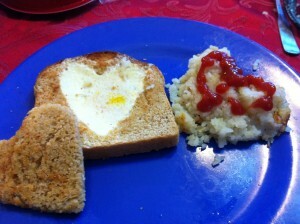 Thank you, Pinterest for this fun idea for Valentine’s Breakfast… egg cooked right into the bread – how fun is that?? It was also the easiest Valentine’s Day breakfast I have ever made… simply cut out the center of the toast with a heart cookie cutter, then put the toast on the grill, cracked an egg in the middle (pinterest didn’t have you turn it over, but I’m not such a lover of sunny side up eggs, so I flipped mine! ), and whalla… a super cute, yummy, and (most importantly) easy dish for the kiddos! of course, if you scroll out a bit on the plate… you will find the ‘rest of the story’… ;). My dad has had a tradition of getting everyone their own, personal box of chocolates, complete with a love note written on his prescription pad paper. This has been happening since my earliest memories of Valentine’s Day, and it has passed onto his grand-kids. 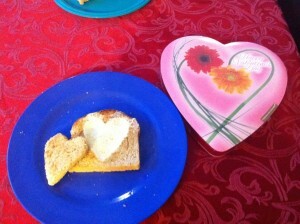 Valentine’s day is the one day that I just let the kids dive into the sweets right at breakfast time. so there you have it, full disclosure… :). This blog post has been zooming through the web world like a loose hogwarts snipe. I read it and found myself saying, “amen, sista!” all throughout. How perfectly she captured motherhood moments. I have learned that this is my mommyhood point of reconnection. As in, re-connecting myself with some semblance of sanity. There really are moments during the thick of the day when I have thought the words, “someone in this house is not going to make it to tonight – it’s either one of the kids, or me!” and yet, each night as the ‘GO BACK TO BED’ cries die down, the giggling from the shared rooms settle down, and sweet silence coats the second level, I sometimes like to take a peak at their sweet sleeping faces. These are the times that I remember truly how sweet they are, and that in the end going through the trenches of mothering is really worth it. These are the times when I can honestly and truly answer the older women’s warnings to “CHERISH THE MOMENTS NOW!” with a heartfelt, “thank you!” Because, for this brief moment in eternity, I get to have every person who is physically a part of me all together, within the walls of my own home. Those are the moments that I truly do wish for time to pause for a brief moment so that I can bask in it for one small second longer. I don’t kid myself into thinking that tomorrow is going to be all ‘gleefully skipping through the meadows for a perfect family picnic’ but seizing the sleep moments truly does help me come back and regroup, and get ready to get up again to climb right back into the poppy diapers and tantrum territory.